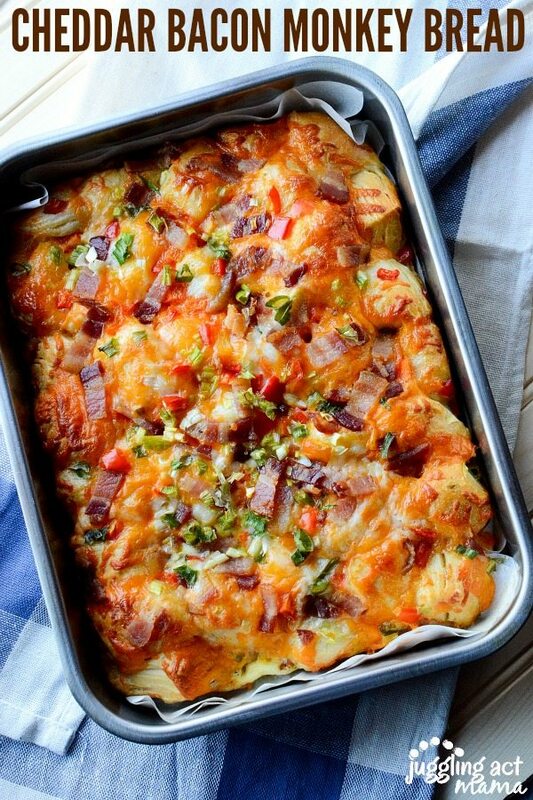 Whip up this shortcut Cheddar Bacon Breakfast Bake Recipe in no time and wow your guests! Being the busy mom that I am, I love taking shortcuts when I can. This is especially true around the holidays. There are just so many things on the to-do list, that I don’t have time to make every single thing from scratch. If you’re a regular Juggling Act Mama reader, you know that I’m a big fan of semi-homemade cooking. 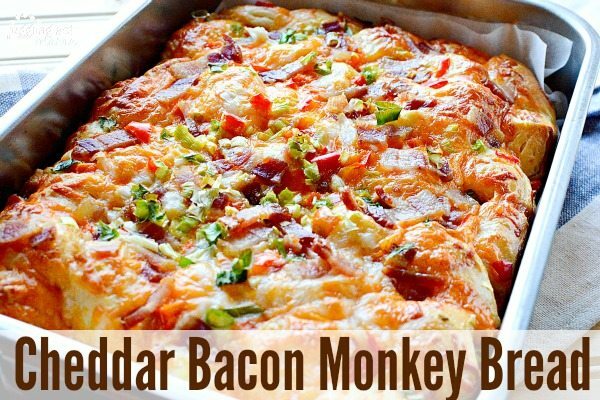 This Cheddar Bacon Monkey Bread recipe is semi-homemade cooking at it’s best! 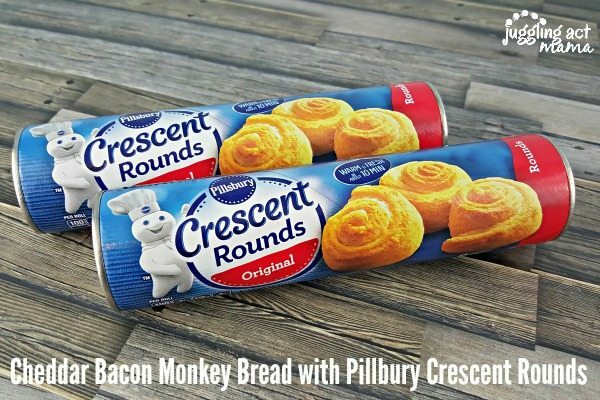 I headed off to Shaw’s to pick up my grocery list, including Pillsbury Crescent Rounds. This recipe starts with simple, but delicious ingredients. I love semi-homemade recipes because they mean I can spend more time with my family, and less time in the kitchen. 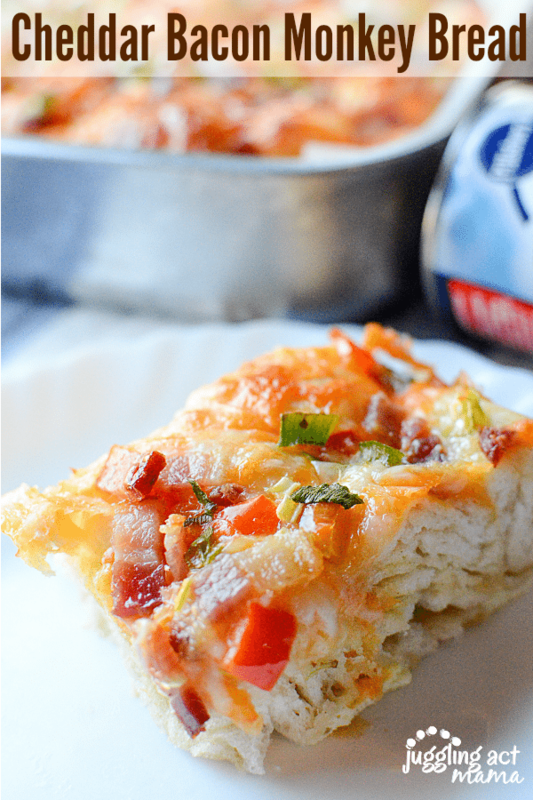 With everything all in one dish as part of this breakfast bake recipe, there’s not much more you need! Consider serving a fruit salad, parfait or fun smoothie as part of your breakfast or brunch. You’re going to love how easy this to make! Heat oven to 350-degree F. Spray 11x7- or 12x8-inch glass baking dish with cooking spray and set aside. In large bowl, beat egg and milk with wire whisk until smooth. Add in some salt and pepper to taste. Separate dough into 8 pieces; cut each into quarters. Gently stir dough pieces into egg mixture to coat evenly. Fold in bacon, cheese, red peppers and green onions. Spoon mixture into sprayed dish; arrange dough pieces in single layer. Bake for for 23 to 28 minutes or until golden brown. Cut into squares and serve warm. You can switch up the red pepper for any color you like. Add 1/4 cup finely diced onions for a more savory flavor. No bacon on hand? Just swap it out for ham or sausage. So much yummy goodness! It’s perfect as an addition to brunch, appetizer, and of course game day. After all, who doesn’t love anything with bacon and cheese? 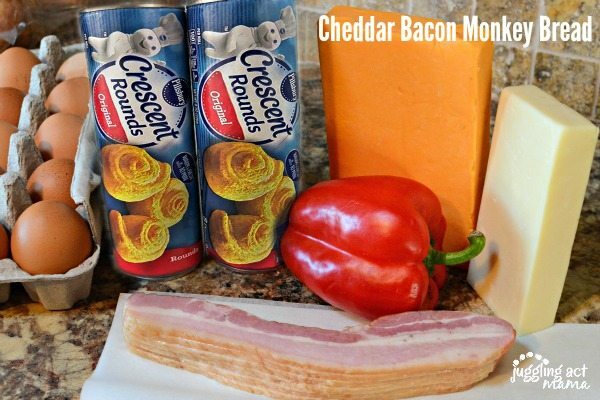 The texture of the Pillsbury Crescent Rounds are perfect for this recipe. They really compliment the crispy bacon and gooey cheese! PS – If you’re running around like a crazy person, too, you might like to check out my Busy Moms Survival Guide! Totally in love with this idea so I made it for Christmas morning and everyone loved it!